By The Ventures. Arranged by Stephen Rockey. Score, Set of Parts. 24 pages. Published by Stephen Rockey (H0.246341-313500). 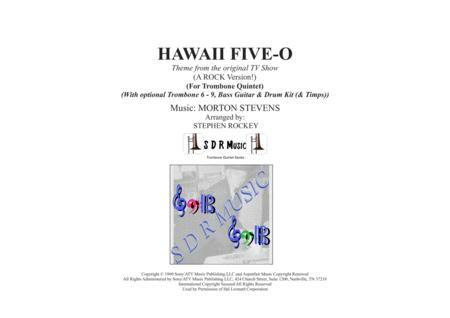 Hawaii Five-O for Trombone Quintet. This arrangement works with just five trombones, but there are extra optional parts available, Trombones 5 to 9 (making a trombone dectet) Bass Guitar, Drum Kit and Timpani. Great fun to play, but is not easy or for the feint hearted. The mp3 fades in and out of the Quintet and full Dectet version. I hope you enjoy playing this. Great for any concert, opener, filler, encore.